Padlock mounting chains are meant to help secure a padlock near to its hasp so that when it’s unlocked it does not get lost. Mounting chains are not meant to secure anything and are generally attached using a screw on one end. The other end of the chain will go around the shackle of the padlock. For ease of use mounting chains are generally installed by us at time of order on the side opposite the opening so they cannot come off. If you order a chain with a padlock we will by default install it. If you wish to add a chain after the fact and have us install it you can send us the lock and we will do so free of charge. 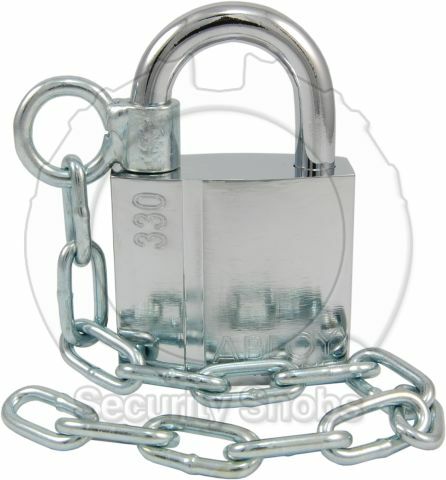 Abloy Padlock PL330 Mount Chain was successfuly added to your shopping cart. You can browse for more products or proceed to checkout.